Want to Help Purchase a Lime Green Icicle Tower? From the minute the artwork went up last spring at Boston's Museum of Fine Arts, says museum director Malcolm A. Rogers, visitors have besieged him with one question. "They ask, 'Are we keeping it?' and I know exactly what 'it' is." "It" is "Lime Green Icicle Tower," a 42-foot-tall, 9-foot-wide spiky column confected from 2,342 pieces of blown glass that together weigh some 10,000 pounds. The tower is so popular that the MFA recently launched a public campaign to buy it—only the third such appeal in its 135-year history. "Lime Green Icicle Tower," which was made for the MFA's soaring glass courtyard by artist Dale Chihuly, is part of an exhibition entitled "Chihuly: Through the Looking Glass." Although Mr. Chihuly is controversial in the art world—some experts see his works as overwrought, repetitive and lacking in intellectual content—more than 360,000 people have seen the show since it opened on April 10. When it closes on Monday, it will be the MFA's fifth biggest draw ever. Six of his famous bulbous chandeliers, including a silvery one, are there, as well as newer works, like the 17-foot-long "Ikebana Boat," filled with colorful, whimsical but unrecognizable forms. But only the neon-hued tower, which looks like a cross between a cactus and a poplar tree, has generated a flood of inquiries and regularly had its picture taken. 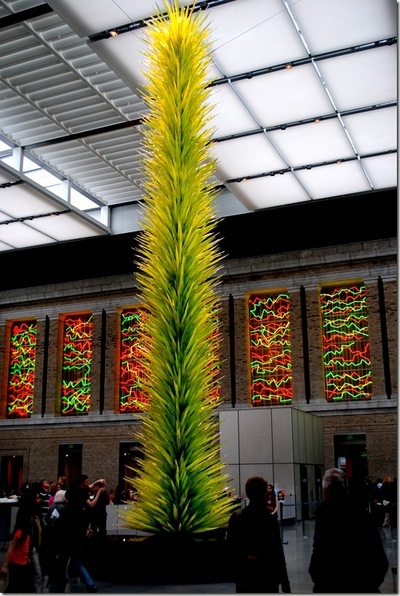 Even Chihuly detractors seem to think that it should stay at the MFA. So, on July 18, the museum placed a contribution box next to the piece and sent an email to members and recent visitors asking for donations. A week later, it activated its first-ever mobile giving scheme, allowing people to give $10 by texting TOWER to 50555. As of Friday, small donors had contributed about $28,000—not bad, except that the museum needs to raise more than $1 million to buy the piece. Five major museum patrons have chipped in to raise the total to about $320,000, and another recently promised to match public gifts, dollar-for-dollar, up to $150,000 on top of that. Mr. Rogers says that he will not use funds budgeted for acquisitions for the piece—partly on principle: "We're offering people an opportunity to play an active role in our future, sending the message that people can make a difference." Besides, he adds, "I'm totally confident that we will raise what we need for it."